Here is one method of front suspension for a bicycle that came out in 1889! 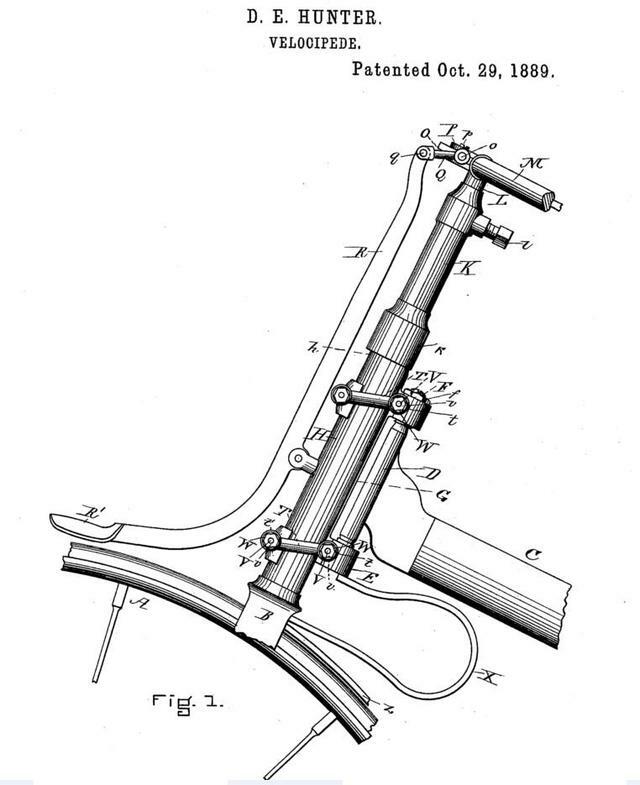 This was patented by J. S. Copeland. When the front wheel hits a bump, it can travel up in relation to the frame. It also has a cool spoon brake, which was the norm before caliper brakes were invented. It is the same idea as shown in the Softride shock absorber stem above, which is also a parallelogram with a strong spring, to cushion some shock from hard bumps. 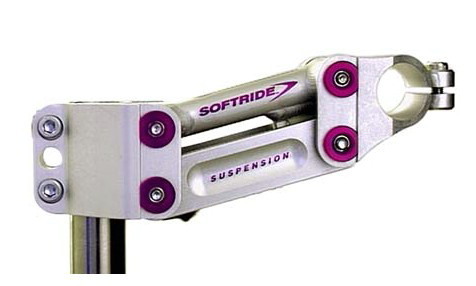 But in the Softride version, the wheel doesn’t travel up, the handlebars travel down. My friend Kurt inUtah really likes his Softride stem, and has used it for years. I found that I needed to replace my factory bearings at 5 years of all weather commuting on my Catrike speed. I opted for a set of 4 cartridge bearings, rather than using the teflon bushings for the upper bearings. A great place to get these is Utah Trikes, who know exactly the size that is needed for Catrike bearings. The teflon bushings were made available to eliminate shimmy problems that certain models of Catrikes were having at certain speeds. I just never had the shimmy problem, so decided to keep the ball bearing type cartridge bearings. These are available from Utah Trikes for $10 each, for a total of $40. To replace the headset bearings, you loosen and remove the top cap bolt and top cap, and loosen the handlebar clamp. When that is removed the steerer tube (the tube inside the head tube) can drop out of the head tube, so keep a grip on it to guide it out. Remove the top bearing, then remove the steerer tube from the head tube. You don’t have to disconnect the tie rod in order to remove the steerer tube from the head tube. When the steerer tube is free of the head tube, remove and replace the bottom bearings. Put the steerer tube back in the head tube, and replace the top bearing. Put the bearings in oriented the same way as they were when you removed them. To cinch the bearings together on the steerer tube, put the handlebar on the top of the steerer tube, but don’t tighten the bolts. Put the top cap and top cap bolt on the steerer tube, and begin tightening. The top bolt engages a star nut inside the steerer tube to tighten up the assembly. At first there will be a lot of play in the steering tube in the head tube, but as the top cap nut is tightened, there will be less and less play. The top cap bolt will be “tight” when there is no “tick of play” and the bearings still allow the steerer tube to turn freely. When that point is reached, tighten the handlebar bolts. Its really the handlebar bolts that hold the steerer tube in place at the proper tightness. Check to be sure there is no “tick of play” in the bearings. If any play develops in the steerer tube, loosen the handlebar bolts, tighten the top cap bolt, and then tighten the handlebar bolts. Once the handlebar is secured, you can remove the top cap bolt if need be to install or remove the front fenders on a Catrike. 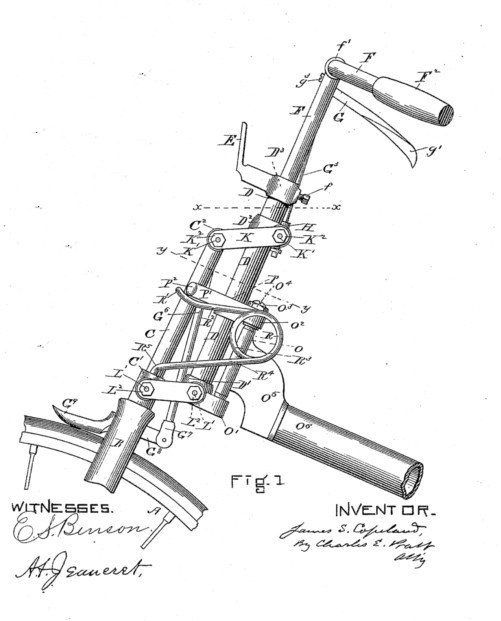 Here is a nifty front end suspension for a bicycle, from 1889. In this design, when the front wheel hits a bump the front wheel and handlebars move up in relation to the frame. Thus the rider is not really protected from shock, it seems to me. Am I seeing how this works incorrectly?